An artefact is typically defined as any feature in an image or sequence that misrepresents the object in the field of view. Artefact manifestations include an additional unexpected signal on the image or sequence, a lack of signal or image distortion. 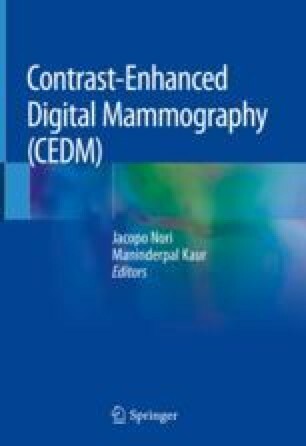 As with any imaging modality, artefacts in contrast-enhanced digital mammography (CEDM) can interfere with image quality, and their effects can vary from negligible to severe, possibly leading to unnecessary procedures or hiding underlying abnormalities. Although some of these artefacts are similar to those observed with full-field digital mammography (FFDM), many are unique to CEDM. In this chapter, we survey examples of artefacts and other factors that interfere with image acquisition observed with CEDM in our clinical practices at Careggi University Hospital and Kuala Lumpur Hospital (KLH), and we highlight the necessary steps to reduce and eliminate these artefacts.